Jonathan had a bit of a rough week last week. During one particular afternoon while I was attempting to get some cleaning done, I pulled out this activity to entertain him. I got the idea from the book Small Beginnings by Barbara Curtis. This activity helped him to concentrate, develop some fine motor skills, and be more aware of left and right. It entertained him long enough that I could get some cleaning done-- so it was definitely a success! To get more Montessori ideas, visit Montessori Monday over at One Hook Wonder and Living Montessori Now! Using a two-compartment cat dish is a unique twist for this activity - and works very well! Great idea to extend the activity by having your son wash his fruits and vegetables. Thanks for linking up with Montessori Monday! 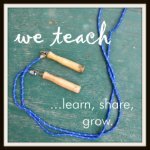 I featured your post at the Living Montessori Now Facebook page! My little guy would LOVE this!! I would have never thought of using a cat dish for this. Great idea!! Thanks for linking up!